The NVIDIA GeForce GTX Titan Z is the company’s latest dual GPU graphics processor, featuring two full GK110 cores. However, many people were disappointed with this card due to its insanely reported price tag, which is around $2,999 USD. 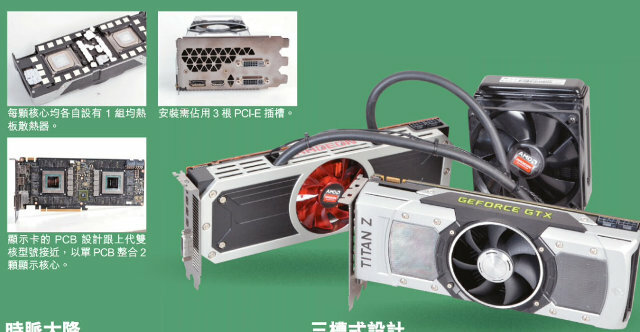 What is even more disappointing is the early leaked result of the GeForce GTX Titan Z review posted by a LinusTechTips forum member (Dipper315), originally from a Hong Kong Computer Hardware Magazine E-Zone. Check out more details and the results of the review below. The source of the review shows that the GeForce GTX Titan Z features a base clock of 706MHz and boost clock speed of 876MHz. It has two full GK 110 Cores (GK-110-350-B1) and has a total unified shader of 5760, 480 TMU and 96 ROPs. It has a total of 12GB GDDR5 memory with a memory clock speed of 7010MHz, running on a 384-bit memory interface. It also has a maximum TDP of 375W and uses two 8-pin power connectors. The source also confirmed that the core used in the Titan Z is a downgraded version of the GTX 780 Ti. Below are screenshots showing the GPU-Z of the Titan Z and its specifications compared with other graphics card like the AMD Radeon R9 295X2, R9 290X, GTX Titan Black and GTX 780 Ti. As you can see from the table above, not only did the AMD Radeon R9 295X2 beat the GeForce GTX Titan Z in terms of price, but it also beat it in some of the games and benchmarks. You can also see that the GeForce GTX 780 Ti SLI is generally faster, both in games and synthetic benchmarks, making it the better and cheaper option amongst the compared graphics cards. The image above also shows that the 876MHz is not its final boost speed. The Titan Z can still be pushed further to 1058MHz, unfortunately it was not able to maintain that speed throughout the test. Perhaps this was the “improvement” previously reported, and one of the main reasons why the Titan Z was delayed. Moving on, the review also revealed the Titan Z’s power consumption and temperature. The first row on the image below shows the total wattage on idle, 2nd row is wattage while running 3D Mark, third row is idle temperature and the last row shows the temperature while running 3D Mark. If all results shown in the review were accurate and close to real world situations, the GeForce GTX Titan Z is not worth buying at all, and it is probably the worst move for a PC gamer with 4K display. Some would prefer the AMD Radeon R9 295X2 but the GTX 780 Ti SLI is still a faster and cheaper option. Intel Core i7-4790K and Core i5-4690K Devil’s Canyon Specifications Revealed – 5.GHz Overclock Possible on Air!